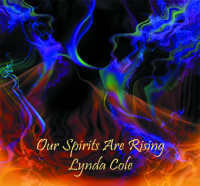 Lynda is proud to announce the release of her new singer-songwriter CD “Our Spirits Are Rising”.This cd is an eclectic blend of music featuring Lynda’s original vocal and instrumental music.These are songs of spirit, hope,peace,connection and playfulness, with hints of New Age, Latin, Blues, Native American, and jazz blended in Lynda’s own unique style. Lynda performs on soprano,alto,and bass silver flutes, Native American flute, voice,and harp. She has guest artists on guitar, percussion, cello, upright bass and piano.